Making his first start in a week, Aledmys Diaz went 2-for-4 with two runs scored, four RBI, and a home run on Sunday against the A's. With the Astros' stacked infield, it will be hard to see Diaz getting regular playing time. 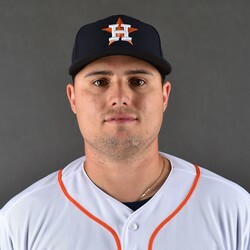 To the extent either Alex Bregman or Carlos Correa suffered an injury, however, Diaz would immediately become an intriguing add. For now, however, he remains just a cheap DFS play when he finds his way into the starting lineup.